Shanghai is a city in China that has combined and adapted cultures from all over the world. Thousands of travelers come to visit here for its famous attractions, as well as its food. For business aviation travel, because it has become one of Asia’s financial centers and the world’s busiest container port, it is also one of the most popular destinations for business owners. There are two major airports in Shanghai: Hongqiao International Airport (SHA / ZSSS) mainly for domestic flights, and Pudong International Airport (PVG / ZSPD) mainly for international flights. In-flight catering for private aircraft is available at both airports in Shanghai through the Air Culinaire Worldwide Network. Once you land, you will have many amazing options for sightseeing and experiencing authentic Chinese cuisine. Below I share my favorite local sites and traditional dishes. The Bund – Located on the bank of Huangpu River in downtown, this is one of my favorite places in Shanghai. To its west are 52 classic buildings of gothic and baroque styles which used to house old Shanghai’s financial institutions and trading company. To its east, you can have a full view of one of the tallest buildings in the worlds across the river. The Bund is now acclaimed as an outdoor museum of international architecture. Besides, the Bund is one of the best places to find some Michelin-starred restaurants, nightclubs and spas. Yu Garden – If you are looking for a good bargain, this is the place to shop. Adjoining old Chenghuangmiao, this 400-year-old Ming dynasty private garden is a tourist attraction. They have the most famous Shanghai soup dumpling store and Mid-Lake Pavilion Teahouse with beautiful views. To top the experience there, you can also take a tour around the whole Yu Garden with the traditional Huangbaoche (pulled rickshaw). · The Oriental Pearl TV Tower – This 468-meter high tower is the highest tower in Asia and the third highest tower in the world. In addition to the three spheres, this tower also contains at the base, three massive poles and space capsule. · Shanghai World Financial Center – For me, the most impressive thing of this 492-meter building is Sky Arena 94 on the 94th floor, Sky Walk on the 97th floor and Sky Walk 100 on 100th floor. When you are up high and standing on the glass floor, it will make you feel like you are walking on clouds. · Jin Mao Tower – “The Golden Prosperity Building” – This 88-story landmark skyscraper contains a shopping mall, offices and the Grand Hyatt Shanghai hotel. It is famous for its structure because it is a modern building combined with traditional Chinese architecture, such as the tiered pagoda, gently stepping back to create a rhythmic pattern as it rises. Shanghai MaoXie (Shanghai Hairy Crab) – The Shanghai Hairy Crab is my favorite seafood. Its season is usually in late fall to early winter. This crab is named for its furry claws. The meat is tender, juicy and delicious. It can be stir-fried with brown sauce, but it is delicious if it is just steamed and consumed with vinegar. Lion Head Meatballs – This famous meatball dish got its name from its shape, that is supposed to resemble the head of the lion. The decorative vegetables resemble the lion’s mane. Traditionally, they are cooked plain or with soy sauce. Red Braised Pork – Pork belly cooked with rice wine first until the fat and skin are gelatinous, so that it can melt easily in the mouth for awesome texture. It is usually cooked with garlic, scallions, pepper, sugar and soy sauce, so the sauce is sticky and tasty. Sweet and Sour Spare Ribs – This dish in Chinese is literally called “sugar and vinegar spareribs,” which indicates the main ingredients of this dish. Drunken Chicken – After the chicken is steamed and cooked with scallions, ginger and salt, it is marinated in Chinese distilled liquor overnight in the refrigerator. Served chilled, the poultry is a heady, salty delight. Mini Wontons in Soup – Tiny wontons in hot broth decorated with cilantro, dried shrimp and strips of eggs is a popular breakfast choice for Shanghainese. “Four Heavenly Kings” – The most well-known foods for breakfast are the Four Heavenly Kings which include dabing (a thin pancake with sesame seeds), youtiao (deep-fried sticks of dough), ci fan tuan (steamed balls of sticky rice) and soy milk. This is the most common breakfast you can find anywhere on the streets in Shanghai. 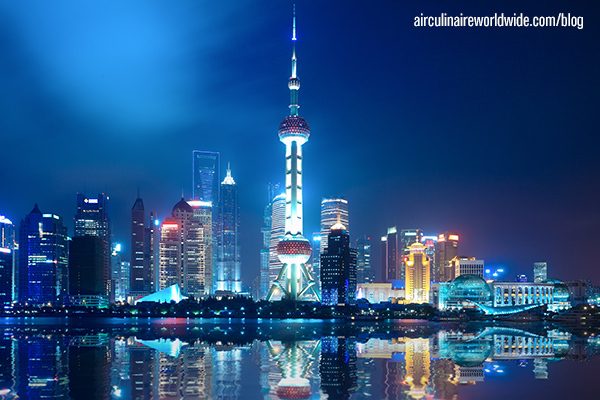 If you have any questions about in-flight catering in Shanghai, contact weborders@airculinaire.com.